Choice of turkey, roast beef, ham, tuna salad, crab salad or chicken salad on whole wheat bread. Served with a cup of soup and a small salad. A smaller version of our popular (Julian, Cesar or Chicken Tender) served with a bowl of soup. Large flour tortilla loaded with diced chicken, melted Jack & cheddar cheese. Served with salsa and sour cream. Fresh spinach, mushroom, tomato, peppers melted Jack and cheddar cheese. Served with salsa and sour cream. Deep fried waffle fries to a crisp golden brown, smothered with cheddar cheese and topped with crispy bacon. Served with Santa Fe Dressing. Hot creamy mixture of spinach, artichoke, and cream cheese, served with tortilla chips. A creamy mixture of spinach, artichoke and cream cheese, tomato and mozzarella cheese served on a thin crust. Why settle for one when you can sample more, choose five; Mozzarella sticks, zucchini, mushrooms, jalapeño poppers, onion straws or mini tacos served with marinara sauce & ranch dressing. Six Jalapeños stuffed with cream cheese, deep-fried and served with salsa. 12 mini tacos, served with sour cream & salsa. Freshly breaded tender calamari deep fried and served with cocktail sauce and lemon. Freshly breaded tender calamari, deep fried and tossed in our garlic-giardiniera mix. Lightly breaded jumbo shrimp, deep fried and tossed in buffalo sauce , served with ranch dressing. Tempura battered mushrooms deep fried and served with our homemade ranch dressing. Tortilla chips topped with taco meat loads of melted cheddar cheese, tomatoes, olives, jalapeños and sour cream. Char-Grilled boneless skinless chicken breast served with cottage cheese, hard-boiled egg, slices of tomato and fresh fruit. Char-Grilled Hamburger patty to your liking served with cottage cheese, hard-boiled egg, slices of tomato and fresh fruit. Char-Grilled turkey burger patty served with cottage cheese, hard-boiled egg, slices of tomato and fresh fruit. Choice of your with cottage cheese, hard-boiled egg, slices of tomato and fresh fruit. Generous portion lox, capers, toasted bagel, cream cheese, slices of tomato and fresh fruit. Char-Grilled Blackened Chicken breast atop a crispy lettuce, diced tomatoes, toasted pecans and golden raisins tossed in our signature spicy ranch dressing. Char-Grilled mesquite seasoned chicken breast atop of mixed greens tossed together with cheddar cheese, tomatoes, green onions, tortilla strips and very own Santé-Fe-Ranch dressing. Mixed greens, tomatoes, green peppers, onions, cucumbers, black olives & feta cheese mixed with our own house dressing. A crispy tortilla bowl filled mixed green and topped with Taco meat, cheese, black olives tomato & sour cream. Lettuce, tomato, ham, turkey, hard boiled egg with Swiss Cheese and American Cheese. Crispy Chicken Tenders tossed in buffalo sauce atop mixed greens’ tossed together with shredded cheddar, tomatoes and crispy bacon bits and ranch dressing. Crispy Chicken Tenders atop mixed greens tossed together with shredded cheddar, tomatoes and crispy bacon bits and ranch dressing. Mixed greens, grilled chicken, avocado mushroom, chopped egg, tomato, bacon pieces, crumbled blue 6cheese. choice of dressing. 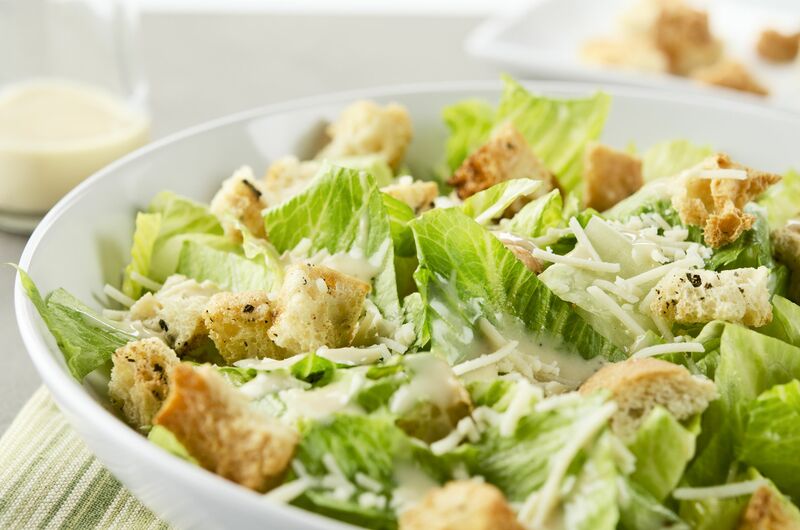 Crispy romaine, croutons, and parmesan cheese tossed with a creamy Caesar dressing. Crispy romaine, croutons, and parmesan cheese tossed with a creamy Caesar dressing and topped with a grilled chicken breast. Half pound of lean ground beef topped with bacon, grilled onions, mushrooms, American & Swiss cheese. Half pound of lean ground beef char-grilled, topped with bacon, Monterey Jack cheese lettuce & tomato served on grilled sourdough breaded peppers, onions, and Mozzarella. Or sub Chicken. Half pound of lean ground beef grilled to perfection topped with BBQ sauce, bacon and Swiss Cheese served on a bun. Half pound of lean ground beef grilled to perfection topped with grilled onion, bacon an cheese sauce served on an onion roll. Half pound of lean ground beef with grilled onions and American cheese on grilled rye bread. Half pound of all white meat freshly ground and seasoned with our blend of savory seasoning. A fresh Boneless breast blackened & grilled to perfection with Cajun spices served on a bun with a side of mayo. A fresh boneless chicken breast served on grilled rye with melted Swiss cheese, crispy bacon, thousand- island dressing, lettuce, and tomatoes. A fresh boneless chicken breast grilled, topped with ham and Swiss cheese served on a bun. Grilled boneless chicken breast topped with bacon, BBQ. sauce and Swiss cheese and served on a bun. Breaded chicken breast deep fried until golden brown and served on a bun with a side of mayonnaise. Breaded chicken breast, deep fried and tossed in buffalo sauce, served on a bun. Char-Grilled mesquite seasoned chicken breast, ripe avocado, Pepper-jack cheese, crispy bacon and with cilantro jalapeño lime pesto crema coleslaw, served on a toasted bun. Classic with a twist, bacon lettuce, tomatoes, and mayo wrapped in a tomato tortilla. Strips of grilled chicken breast tossed in romaine lettuce, parmesan cheese and creamy Caesar dressing all rolled up in a tomato tortilla. Crispy chicken tenders, buffalo sauce, blue cheese crumble, lettuce. tomato with Ranch dressing and wrapped in a tomato tortilla. Sliced turkey, crispy bacon, lettuce tomato mayo and slices of tomato all wrapped in a tomato tortilla. A mixture of seasonal vegetables, rice, salsa, roasted corn and black beans wrapped in a tomato tortilla. Tomato flavored tortilla filled with seasoned chicken, shredded Cheddar, lettuce, and tomato. Crunchy bite sized shrimp, cilantro jalapeño lime pesto crema coleslaw, crispy lettuce, tomato, cheddar-jack cheese all wrapped in a tomato tortilla. All clubs and croissants served with French fries, steak fries, Cajun fries, Cole slaw, pasta salad, potato salad or cottage cheese. Sliced Breast of turkey, bacon, lettuce, tomato, and mayo. Sliced ham, American cheese, lettuce, tomato, mayo. Sliced corned beef, Swiss cheese, lettuce, tomato, and mayo. Roast beef, Swiss cheese, country ham, American cheese, lettuce tomato, and mayo. 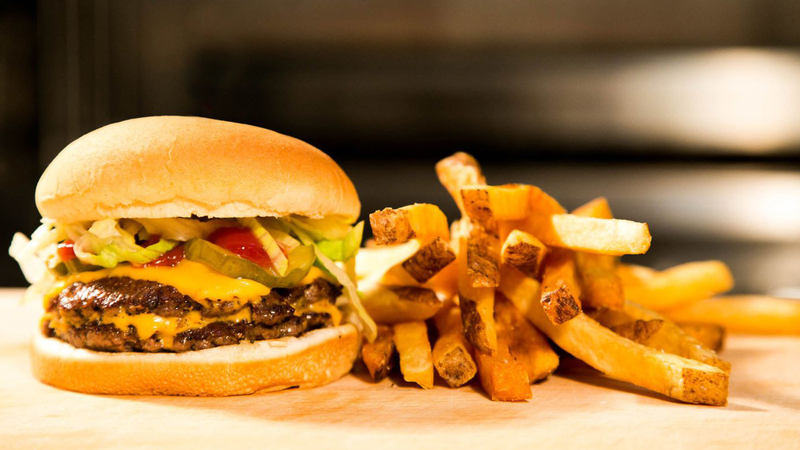 All Sandwiches served W/French fries, steak fries, Cajun fries, Cole slaw, pasta salad, potato salad or cottage cheese. Seasoned Beef on a French roll, served with au jus. Our own beef sandwich with mozzarella cheese and au jus served on garlic French Roll. Ham, turkey, American and Swiss cheeses on Texas toast dipped in French toast batter and grilled to golden brown. Sliced corned beef, Swiss cheese, sauerkraut, Thousand Island dressing served on g riled marbled rye bread. Sliced Breast of roast turkey, Swiss cheese, sauerkraut, Thousand Island dressing served on g riled marbled rye bread. Grilled steak with peppers onions and mushrooms topped with Swiss cheese and served on a garlic French roll. Italian beef with grilled onions, red pepper garlic mayo, mozzarella cheese, lettuce, and tomato on grilled rye bread. Sliced corned beef served on rye bread an horseradish sauce. Rib eye steak char-grilled to your liking, topped with grilled onions and mushrooms, served on garlic Texas Toast. Breaded pork tenderloin deep fried and served on a toasted bun. 8 oz. N.Y. Strip steak char-grilled to your liking, served on French bread with grilled onions and mushroom. Grilled Sourdough bread with Monterey Jack cheese, red pepper garlic mayo, and grilled breast of turkey. Generous portion of thinly sliced roast turkey piled on rye bread served with a side of mayo. Breaded cod fillet deep fried served on a bun with lettuce, tomato and tartar sauce. Four pieces of lightly floured lake deep fried served on a bun with lettuce, tomato and tartar sauce. Roasted Pork served over white bread and smothered in brown gravy and mashed potatoes. A breaded pork patty served over white bread, smothered in brown gravy and mashed potatoes. Our own roast beef served over white bread and smothered in brown gravy and mashed potatoes. Breast of turkey piled over white bread and smothered in brown gravy and mashed potatoes. Your choice of meat wrapped in a flour tortilla with beans, rice, Cheddar and Jack cheeses, grilled onions, peppers, and tomatoes, splashed with our green salsa. rice pilaf or vegetable. All our steaks are seasoned and prepared in high temp char broiler for optimum flavor. Two 8oz each boneless pork chops char-grilled to perfection. Also available blackened or Greek style. Tender chopped sirloin, Char-grilled to your liking smothered in your choice of grilled onion or mushroom served with Au Jus. habanero sweet & spicy BBQ sauces. Jumbo shrimp fried until golden brown and served with lemon & cocktail sauce. Seven pieces of lightly breaded jumbo Shrimp grilled and topped with our own De Jonghe recipe: a perfect mixture of herbs and spices; baked to perfection for the ultimate melt-in-your-mouth experience. Lightly breaded lake perch, sautéed, topped with De Jonghe recipe a perfect mixture of herbs and spices; baked to perfection for the ultimate melt-in-your-mouth experience. A generous portion of lake perch deep fried and served with lemon and tartar sauce Available sautéed. Generous portion ocean perch fillets deep fried. A juicy 8 oz. strip, cooked to your liking, paired with 4 pieces of grilled or deep fried jumbo shrimp. Our top selling walleye fillet lightly floured and sautéed, served with steamed vegetable and choice of potato. Perfectly seasoned, and char-grilled to perfection, served with steamed vegetable and choice of potato. Lightly breaded chicken grilled and topped with our own De Jonghe recipe: a perfect mixture of herbs and spices; baked to perfection for the ultimate melt-in-your-mouth experience served with rice & veggies. Blackened boneless chicken breast smothered in grilled onions and peppers, topped with Pepper Jack cheese and served over a bed of rice & steamed vegetables. Chicken breast smothered with grilled onions, grilled mushrooms, and Mozzarella cheese. Juicy chicken breasts sautéed with shallots and mushroom, simmered in our homemade Marsala cream sauce. Linguine noodles tossed with grilled chicken, spinach, artichokes, tomatoes, feta cheese, garlic, and white wine. Tender fettuccine noodles tossed in our homemade creamy Alfredo sauce. Cheese tortellini in cream of garlic sauce or available with marinara. Chicken Breast lightly breaded and smothered in marinara sauce & topped with Mozzarella cheese, and served over spaghetti and with garlic bread. Breaded Veal Cutlet lightly breaded and smothered in marinara sauce & topped with Mozzarella cheese, and served over spaghetti and with garlic bread. A generous serving of spaghetti smothered in our homemade marinara sauce with freshly rolled meatballs. choice of the following: French fries, steak fries, Cajun fries, baked potato, rice pilaf, cole slaw, pasta salad or potato salad. Enjoy this feast anytime of the year. Fork tender roast breast of turkey served with dressing smothered in rich gravy and cranberry sauce. Slow roasted pork loin, tender and juicy served with dressing, smothered in our rich brown gravy and apple sauce. Tender beef liver grilled and served with bacon and grilled onion. Breaded veal patty deep fried to a golden brown and smothered in our rich brown gravy. Two skewered kabobs served over a bed of rice and fresh grilled vegetables.